I am moving to a new house at the end of the month and it has so many great new things to offer. I have a huge garden. We just planted around 30 different plants, including peppers, tomatoes, squash, cucumbers, eggplant, lettuces, peas and strawberries. We also have about 7 pots of herbs. If things go as planned I will be cooking with my own home-grown veggies all summer long! My new house also has something that many young foodies’ kitchens don’t- counter space! I cannot explain how great it is to finally have room to cook! One thing on my list of things to make in my new kitchen is bread, lots of bread. This week’s throwback recipe is the only time I have made my own bread, other than the two years I spent working at Subway, which I wouldn’t really call making bread anyway. 😉 This was some of the most delicious bread I have ever had. The recipe gives it a delicious salty kick that makes you want to eat a huge piece all by itself. Plan your day if you are going to make this bread, because it takes a long time to let the dough rise properly. If you have never made your own bread, I encourage you to try this recipe; you won’t be disappointed! To make the Biga, combine first 5 ingredients into a well-mixed ball and let rest covered for 4-24 hours on countertop or in fridge overnight. To finish dough, mix all Biga with remaining ingredients on low until blended, then on medium until smooth, soft and somewhat flowing. Let rise in an oiled bowl for about 2 hours (turn and knead dough on a well floured surface every 45 minutes). Divide dough into two pieces (each about 1.5 inches thick) and place on well-floured couche cut edge down and proof another hour or until loaves have doubled in size. Gently flip the bread upside down onto a narrow board, then slide onto a cornmeal-dusted peel so that it remains floured side up. Bake at 500F with steam for 10 minutes, then at 475F until loaves have a good color (15-20 minutes). Remove from oven, slice and enjoy! Like an hour ago I tweeted about how I am CRAVING ciabatta. This isn’t helping 😉 YUM! This type of bread is one of my favorites, yet I have never made it homemade. I am sure that homemade is much better-your slices look delicious. Thanks for sharing. Yum I love ciabatta bread! I’m only starting to bake bread, I have to add this to my list to try. I could dine one ciabatta bread each and every day… I’ve made it a few times but have been lazy lately and been purchasing it at the Farmer’s Market. You’ve inspired me to make my own again! Gorgeous bread…I wish it was cool enough to turn on my oven!!!! I’d love a few warm slices with butter…mmmmmm. Those thick slices look so delicious. I can imagine it warm from the oven with a big blob of butter. I love ciabatta. I usually pick it up at whole foods though Erikson’s makes a really good ciabatta too …. but this is about your ciabatta … it looks really well made with a beautiful crust. Well done! Nothing better than your own potted herbs! In the photo the bread looks authentic. I’m going to try this! Lovely bread! I am getting more and more ambitious with making my own bread. 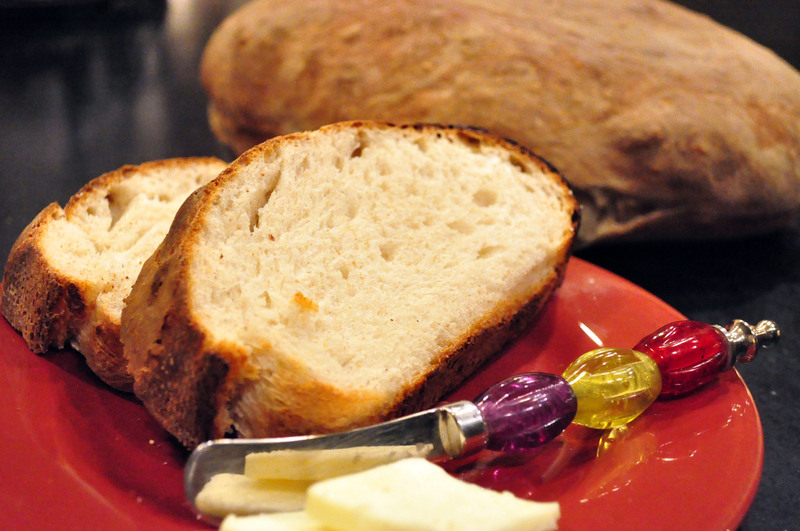 I love Ciabatta bread, I am going to have to bookmark this for later! this bread looks awesome! 🙂 drizzle some olive oil and some cheese on top, perfect! I have tried another ciabatta recipe that was a two day process and did not have good luck. I will give this a try. Thanks! I love a great rustic bread. This sounds great.